Back in 2002, annoyed at shoddy reporting on the oil potential in the Arctic National Wildlife Refuge, ANWR, (more specifically the "1002 Area"), I did some research followed by a brief write-up. In March 2008 I reprinted my write up along with a brief update; followed by a further update a few weeks later (note: scroll down to the second story). Arctic National Wildlife Refuge (ANWR): An Overview was just published this month by the Congressional Research Service (CRS 26-page PDF). This clearly is more comprehensive than my write-up, which only discussed the amount of oil and not the ecological, social, and other aspects of the issue. The report's conclusion? "Enactment of P.L. 115-97 in December 2017 culminated a decades-long debate over whether to allow oil and gas development in ANWR in northeastern Alaska. The law established an oil and gas program for the Refuge’s Coastal Plain, with at least two oil and gas lease sales required in the next 10 years. 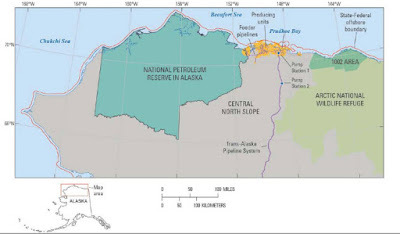 Development proponents contend that the sales will generate economic activity, contribute to U.S. energy security, and result in royalty revenues for both the federal government and the State of Alaska, while opponents express concern that development will detrimentally impact the unique biological resources of the Refuge. P.L. 115-97 requires the first ANWR lease sale within four years of the law’s enactment. Activities preparatory to the lease sale include identifying lands to be leased, conducting sale-specific environmental reviews, issuing notices of sales, and other “prelease” activities. Activities could also include new geological and geophysical (G&G) surveys to determine the extent and location of hydrocarbon resources. Congress could potentially take additional action related to ANWR oil and gas leasing , including through further legislation or through oversight of DOI’s implementation of the provisions of P.L. 115-97. A number of development issues addressed in earlier ANWR bills were not addressed in P.L. 115-97, possibly owing in part to limitations imposed by the budget reconciliation process. Congress could choose to address some of these issues in future legislation amending the oil and gas program or could decide that the provisions of P.L. 115-97 already provide sufficient guidance for the program. Alternatively, Congress could decide to end the program, for example by designating the Refuge’s Coastal Plain as wilderness, as is proposed in some 115th Congress bills. 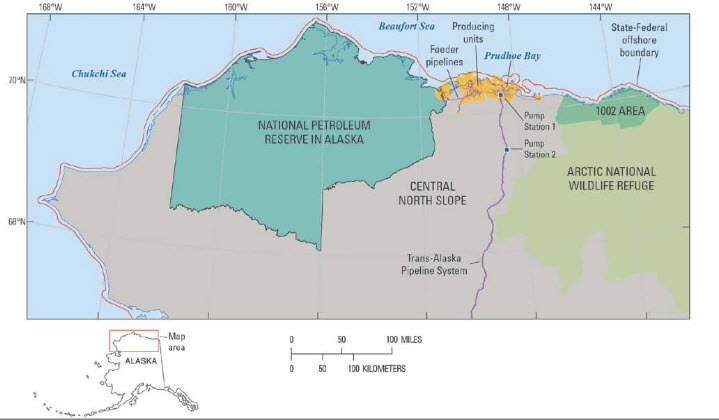 The Congressional Budget Office estimated the state and federal revenue from the first two lease sales in ANWR at approximately $2.2 billion over 10 years. Actual bids will depend on many factors, including market conditions at the time of the lease sales. Development and transportation of oil in the Refuge, as elsewhere in the Arctic, is a difficult and expensive prospect, and a key factor in industry bids will be the price of oil." Back in 2002 an earlier Nuclear Posture Review was completed and in March of that year I wrote a note about it, titled: "NPR - Not Your Father's Public Radio." That is reproduced below (note: fifteen years on many of the original links are no longer working!). My conclusion at the time? That the NPR "seemed somewhat confused" and "on the one hand it discusses doing research to develop smaller, tactical nuclear devices (implicitly agreeing that the majority of the weapons in the current nuclear arsenal are weapons without suitable targets, present or future) while at the same time keeping these increasingly redundant weapons." My verdict? This NPR hearkens back in spirit to the earlier 2002 NPR and is not a huge break from the past. However, like the earlier 2002 NPR it too is "confused" and continues (in vain) the search for additional reasons to have these weapons. P.S. One (small but illustrative) example of the incoherence in the document, the assertion that "U.S. nuclear capabilities..." contribute to "... the deterrence of... non-nuclear aggression." This blogger has never seen a persuasive example of this! In March the classified portion was leaked and became public NPR excerpts on globalsecurity.org, immediately causing a furor by naming countries that might be nuclear targets, and also seeming to endorse the use of nuclear weapons. The story was broken by a couple of articles in the LA Times. Tora Bora cave complex in Afghanistan a Republican Indiana congressman suggested that the use of nuclear weapons should be considered to destroy and seal up the caves. So, what could nuclear weapons be used for (putting aside for the moment arguments about other aspects of their use)? It is hard to see any practical use for nuclear weapons that could not be accomplished by the use of conventional, non-nuclear firepower except perhaps the destruction of hardened, subterranean targets. The graphic shows the possible use of an existing earth-penetrating nuclear weapon. However, the existing versions of these weapons (e.g. the B61-11) don't have very great penetration, and certainly not enough for all the fallout to be contained in the ground and not dispersed through the air - experiments in Nevada in the '60's showed that for this a (mere) 5 kiloton warhead would need to be 650 feet deep, and a 100 kiloton warhead would have to be 1300 feet underground to avoid a significant amount of radioactive material being vented. Thus new weapons would have to be developed, which would require testing. The US has had a moratorium on testing since 1992. President Clinton signed the Comprehensive Test Ban Treaty in 1996, though the Senate did not ratify it. There is also a 1994 law prohibiting research and development of nuclear weapons smaller than 5 kilotons. Meanwhile advances in bunker busting conventional bombs (e.g. the GBU-28 that is supposedly capable of destroying silo-based ICBMs) make this nuclear option much less compelling. On a different level, it is almost impossible to make a case for when nuclear weapons might be used other than in response to a 'traditional' mass nuclear attack from a nuclear nation such as China or Russia. There are no credible first use scenarios against a non-nuclear power. A nuclear response against a nation in answer to a nuclear (or biological, radioactive, or chemical, etc.) terrorist attack (even if sponsored by a government) also provides no positive advantage, given that all these scenarios can be replied to using an overwhelming conventional response (since the US has the means and the ability to deliver mass destruction wherever it wishes). And the down side is that the first 'routine' use of a nuclear weapon immediately takes these weapons out of the "weapons of mass destruction" category and makes them simply another military option in the arsenal of options. This would 'legitimize' the use of these weapons, destroy years of non-proliferation efforts, and give the green light to nations around the world to develop their own nuclear weapons. This 'legitimizing' effect would be even greater if the US use was not in response to a WMD attack, but simply against a natural feature (mountain caves) or hardened target. Given the above, it is hard to understand where the NPR and the administration seem to be sending US nuclear doctrine. Another confusing thing is the proposed "reduction" of the US nuclear force. President Bush and Russian President Putin discussed significant cutbacks in nuclear warheads, and the administration speaks of the US reducing its nuclear arsenal from its current level of approximately 10,650 warheads to 1,700 - 2,200 by 2012. This reduction allows for a more than sufficient nuclear deterrent, while recognizing that the previous levels are unnecessary given the changed world situation. However, this was followed by the announcement that the warheads reduced would not be decommissioned and destroyed but would be put in storage. Thus the "reduction" from 10,650 to 2,000 would be achieved by changing the terms of the debate - while currently all warheads are counted, under the administration's plan only "operationally deployed warheads" are counted while ignoring all those in testing, being overhauled or upgraded, or in storage. If you continue to count all the categories the US stock will only be reduced from 10,650 to approximately 9,980 by 2012 (see graph). While the reduction in deployed warheads will result in reduced risk it is hard to understand why the 'reduced' warheads will be kept in storage. The 2,200 active warheads are already many times more than might ever be needed, so it is difficult to see a circumstance under which the other warheads might be pulled out of storage and used! In conclusion, the administration's NPR seems somewhat confused. On the one hand it discusses doing research to develop smaller, tactical nuclear devices (implicitly agreeing that the majority of the weapons in the current nuclear arsenal are weapons without suitable targets, present or future) while at the same time keeping these increasingly redundant weapons.